"Doctor of the Church" is a title given to those whose writings are deemed to be in accord with the doctrine of the church and which the church believes can be used as teachings. "Doctor" in this sense is related etymologically to the word "doctrine." (1347 - 1380) was a Dominican tertiary. She is credited with persuading the Pope to return to Rome from Avignon. One of two women declared to be Doctors of the Church in 1970, Teresa of Avila (1515 - 1582) was the founder of the order known as the Discalced Carmelites. Her writings are credited with inspiring church reforms. A third woman was added as Doctor of the Church in 1997: Saint Térèse of Lisieux. 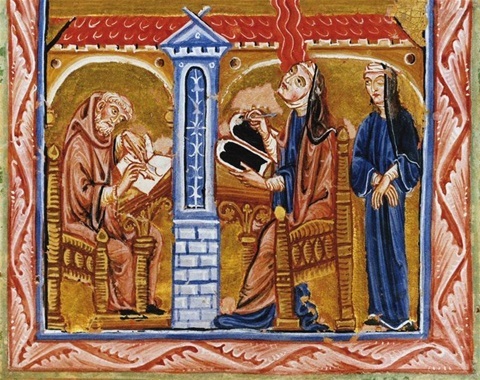 Térèse, like Teresa of Avila, was a Carmelite nun. Lourdes is the largest pilgrimage site in France, and the Basilica of Lisieux is second largest. In October, 2012, Pope Benedict named German saint Hildegard of Bingen, a Benedictine abbess and mystic, a "Renaissance woman" long before the Renaissance, as the fourth woman among the Doctors of the Church.